Let us start from scratch in learning about salesforce and the initial steps we need to follow in any salesforce project to acquire a job in this field. Salesforce is the best platform to start for a newbie, who aspire to have a career in CRM. In this particular platform, you need to have both technical and business knowledge to get shined. As salesforce is a cloud related technology, you have hassle free environment to deal with. Before going to start on salesforce technology, you can start with an agenda. Primary steps before we start any salesforce project. The below conversation between an employee, manager, employer, and the client will detail you about the live situation faced by everyone during their job tenure. Manager In First Meeting:: Good Morning Guys! Congrats. Manager: It’s the first day of your job. You might me thinking why we held this meeting. We have a problem to deal with. So, this urgent meeting is because, as you guys know our company is dealing with various softwares solutions - .net, Java, Php, Oracle, etc, and we have a lot of other projects also. One of our clients has contacted me and said that “Can you give a service in Salesforce Technology”. I said “no”, as we don’t have employees working in salesforce technology. Client: But, I am planning to start the work in few months from now. Manager: Okay, give me some time to start the project, as we don’t lose our valuable customers. Manager: In the meantime, I have posted in job portals for hiring employees, build a team, and start the project. But, the client had contacted me 1 day back and said. Client: I cannot wait for few more months. I want to start the project from the next day itself. Manager: I got surprised as we are not in a position to start the project immediately. I have explained the situation to the CEO, and asked him how we can start this project as we are not having any person with knowledge of salesforce. CEO: I know about that client very well. If we say we cannot start the project, client will look for other company to complete the project. So, we have no option. Explanation from CEO to Manager..
CEO to Manager: We are going to hire some college pass outs and project them as salesforce professionals and get started. Manger: You guys must be surprised because you are college pass outs and how you can work on a project without having any idea of what salesforce is ? So, how things are going to happen ? Don’t worry guys. I have already discussed with CEO about the limitations you are having and I also will work closely with you. I am sending few documents to you. Just go through them and start reading about salesforce. Today evening, we are having a meeting with the client and we proceed daily in this way. Employee: “Okay”, here, we have no option as it is from the boss and we need to proceed according to it. And, the employee started reading about salesforce. Note: A question may arise that why we need to take this hard challenge or decision from the starting level. It is about the market in the IT industry. At least 90 percent of people have faced such kind of situation at least once in their career. The meeting with the client has started in the scheduled time. Client: Fantastic! Nice to meet you and good to know the team is ready. You guys know that my project is urgent. Employee: Sir, we can select from the above plans based on our requirement. I will explain in detail about each plan so that you will have an idea on selecting the plan. Employee explains the pros & cons of each plan in detail to the client. Client: Very happy to have my queries cleared from your side. We will go with the selected plan accordingly. From the above conversation, it is clear that you should not only have technical knowledge but also an overview of client’s business along with salesforce services details as well. The Billing is generated on a monthly basis - per single user. According to the customer selection of plan, the billing is generated. Say, for example the client has selected 150$ plan. 1 user * 150$$ = 150$$/month. 2 user * 150$$ = 300$$/month. 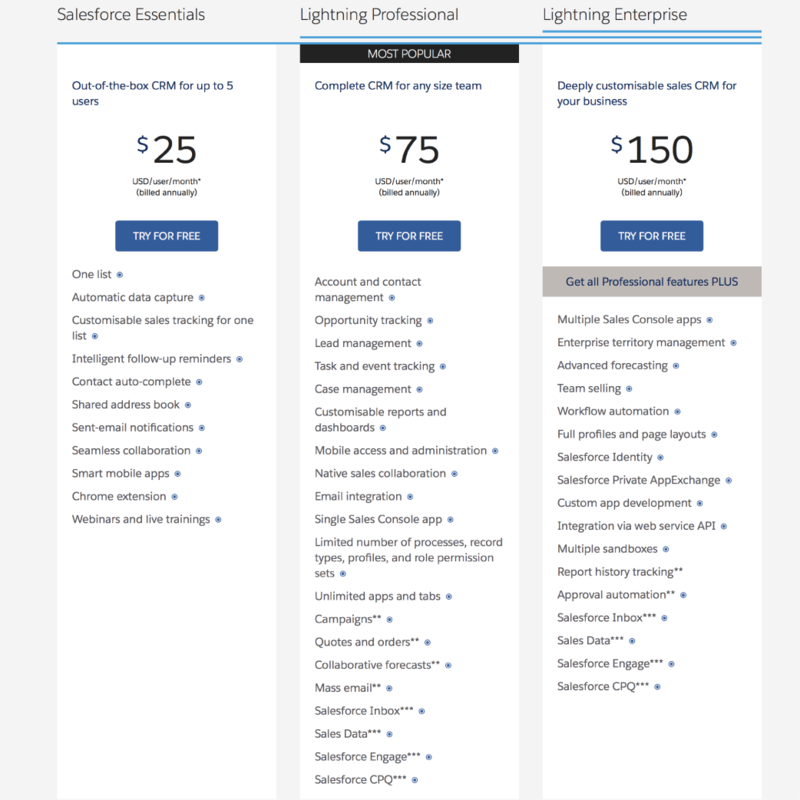 Note: Salesforce never works in months, the minimum subscription would be 1 year. It is the only drawback. According to the latest market trends, in CRM, salesforce is the leading software. Even the cost of salesforce has never become a drawback to success. Salesforce has acquired the No 1 position though it is costly. Because of the kind of features it is providing for the industry, the other companies are lagging behind it. It is the reason companies don’t mind paying a lot of money to Salesforce. Remaining topics will be continued from the next blog...keep following us.